On a mission to transform Malaysia youth from digital users to producers in the digital economy. In support of MDEC #mydigitalmaker movement and MOE’s initiatives to transform Malaysian youth from digital users to producers in the digital economy, Cytron Technologies - rero EDUteam will continue with our initiatives to bring robotics and coding to the masses. In 2019, rero EDUteam will host the first ever rero Educators Conference to gather teachers who are actively involved in rero robotics and coding programmes. The conference serves as a platform for teachers/schools to share experiences and explore ideas for collaboration. During the conference, training will also be provided to further equip and empower the teachers. In March and April, rero EDUteam will visit each state in Malaysia to conduct competition briefing and free workshop for teachers who are new to this platform. There will be two tracks, namely Arduino-Maker UNO track and rero Robotics track. Teachers will also be provided with training resources to coach their students. 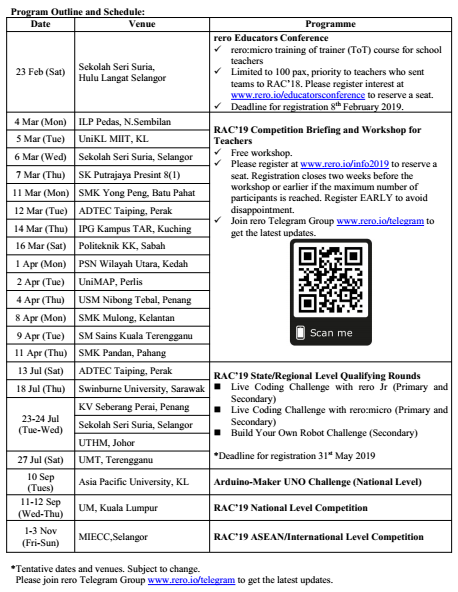 RAC state level competitions will be held in July, followed by national level competition in September, and finally ASEAN/international level, which will be held in November alongside Kuala Lumpur Engineering and Science Fair, KLESF’19. 1. To introduce robotics and coding to more students. 2. To train teachers and student leaders to be certified instructors/facilitators. 3. To provide students with access to robotics kit and education. 4. To provide opportunities for more students to participate in robotics and coding competitions. *Cytron Technologies is a local tech company that designs, manufactures and distributes electronic and educational robotic products such as rero Educational Robotics Kit and Maker UNO (Arduino-UNO compatible) Edu Kit. **rero EDUteam is the education arm of Cytron Technologies. Here's our tentative schedule for 2019. *Tentative dates and venues. Subject to change. Please join rero Telegram Group www.rero.io/telegram to get the latest updates. **To register, please scroll down for the registration links. Please click the respective links below to register. *Limited seats. First come, first served. Registration deadline is 15th February 2019. Registration fee is RM120 per team. Please bank in to the following account and attach the bank slip to the online registration form. Can my school join if we have no experience in robotics and coding? Absolutely. Rero platform is beginner friendly and we provide training and resources to help teachers/students get started on this exciting journey. Our vision is to bring robotics and coding to the masses by making quality robotics and coding education and kits available, affordable and attainable for all. What are the categories for 2019? What kit(s) and programming software do we need to participate? How much does it cost to purchase/rent the required kits? How can we purchase/rent the required kits? You can purchase/rent the required kits from our Regional Training Partners. You can also contact them if you would like to engage trainers to coach your students. For further information, you can contact Ms Cheryl (Education Program Coordinator, rero EDUteam HQ) at 016-3290069 or email to [email protected] OR contact our regional training partners for the respective states as above. Hi, Narumi. Yes, public may come to watch RAC competitions as spectators. Can the public come and see the State/Regional Level Qualifying Rounds? Or is it only for the competitors? Cause I really wanted to see the competition especially when it's nearby my home.